Having a hobby, or several hobbies, can be a wonderful thing. Pursuing a hobby increases one’s pleasure in life and adds fun. A hobby can also lead to acquiring skills, knowledge and experience. Since leaving teaching, I have become almost a serial collector of hobbies. I’ve been on an RHS gardening course which has enhanced a passion for gardening that’s always been lurking. I go and make things out of clay once a week – I won’t say I’m a potter but playing creatively with clay is brilliant fun. I’ve joined a Book Club, which is really an excuse to see old friends and drink wine. And last year I may have taken on a hobby too far: bee keeping! I love everything about this hobby, especially reading about it – the cedar wood hive that smells sweet, planting bee-friendly plants, the arrival of the bees and so on. But the best thing about beekeeping is the people you meet – friendly, helpful and keen to pass on their knowledge and compare notes. I have a theory that most of us get involved in hobbies because the people we meet in the course of doing so are kindred spirits, like-minded souls who share a love of the chosen hobby and much more. On a dark, chilly February evening I visited a group with an interesting hobby in common. Arriving at Burcot Village Hall there was clearly something big going on – a car park full to brimming, hall lights illuminating the area, crowds of people chatting with hot drinks in their hands. 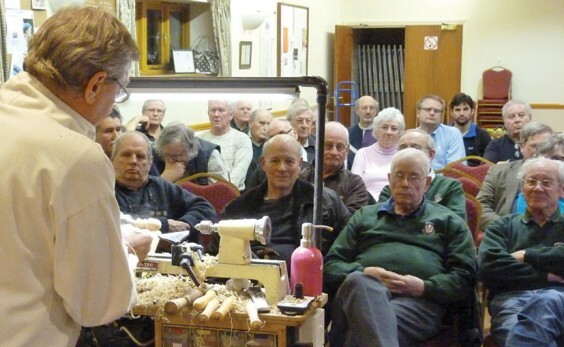 When I’d arranged with John Smith, the club secretary and treasurer, to visit Burcot Woodturners, he had led me to expect that the club was very popular and well attended, but I hadn’t expected to see such a big turnout. Burcot Woodturners was founded in 1997 by Richard Barnes, a professional woodturner working at Burcot Forge. Richard drew in many local members who were later joined by members from further afield. The Burcot branch now has 62 members and most of them were present on this particular “first Thursday of the month”. As you might expect, most members are men but there are a few ladies – wives who have caught the woodturning bug from their husbands, I suspect. Members travel some distance to get to these popular meetings, coming from Stourbridge, Dudley and Stratford as well as Redditch and Bromsgrove. John Cotterell (pictured above) was set up very professionally to demonstrate turning small utility items. With the use of an industrial-looking lathe at the front of an attentive audience, John’s “small utility items” were fab – mushrooms turned from burr wood, bottle stoppers, and the most adorable wooden mouse ever with felt ears and tail. The demonstration was relayed to a large screen so that everyone could see close-up what was going on. I felt as though I was at Wimbledon on Henman Hill/ Murray Mound. The demonstration was interactive so while John created turned items and the wood shavings curled to the ground, he also paused to explain how he was working and to answer questions. A minority female asked the majority of the questions, showing what a friendly and non-threatening group this is. 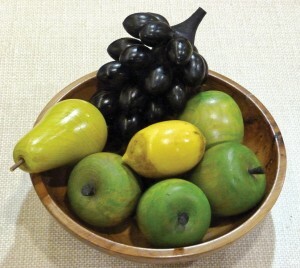 Visit their excellent website, http://www.burcotwoodturners.org.uk, to find out more about this group. They have a full programme of events with an evening get-together and demonstration every month as well as a whole day summer event with a visiting professional. As well as turning, skills such as pyrography (creating decorative patterning by burning the surface of the wood) and air brushing are demonstrated and taught. In particular, I loved the Members’ Work page on the website where you can see work as varied as a beautifully crafted stool and a turned and lightly-coloured platter to vases, bowls, salt cellars and much more. As well as these serious and highly-skilled pieces there are also quirky fun items like Pat Clarke’s witch with light-up “fire” seated under a mushroom, and the cute Christmas items which are donated by members to the Acorns Charity every year. Woodturning strikes me as being therapeutic, creative, skilful and satisfying. And, as with all hobbies, the people are the important thing. Plenty of kindred spirits here. By the way, as I mentioned earlier, my beekeeping hobby might be a hobby too far. At the end of last summer, when the hive was full of honey and, more to the point, very full of bees, I got a bee in my bonnet – literally! I ended up with quite a few stings and a potato-shaped face. So I’ve learned another very important lesson – do your bee suit up properly!